As a key element of our performance improvement activities, we have a range of training workshops, which we tailor to our specific customers` needs and expectations. All our courses are in a unique and fascinating workshop format, where we present the advanced methodologies, maintain an open discussion regarding the feasibility for your organization and perform a case study or simulation. We offer an extensive and wide variety of learning solutions that cover a broad array of business topics. Most chances are that we have what you are looking for within our existing menu of course offerings. However, in addition to our standard courses, our instructional designers and subject matter experts will be glad working with your organization, to develop a custom tailored curriculum to meet your very specific needs. We can develop learning content that blends seamlessly with your existing training, create completely new course content or an entire curriculum, or convert existing classroom content into eLearning. and obviously work as project or programs managers. RBS cooperates with the Technion external division and running about 10 courses per each academic year both In Haifa and Tel-Aviv. 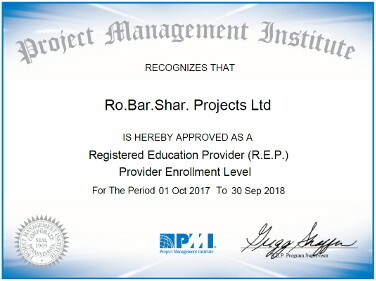 RBS Projects Ltd is a PMI® R.E.P #3048 (Certified Registered Education Provider by PMI®) and we do have the largest amount of training experience all over our region.